මීලග වසර 7 තුල ගායනා කල ගීත අතර සමහර ගීත අති ඡනප්‍රිය විය. ඵවා නම් ඹ්ලු පිපීලා (ප්‍රථම පටිගත ගීතය) ,"හදපානේ", "හෝ ගා රැලනැගෙයි", " බෝවිටියා දං පලුකන් වාරේ", " සුවද රෝස මල් නෙලා" , "කෝකිලයන්ගේ" සහ " මිහිකත නලවලා" වේ. ඔහු ගායනා කල ගීත සිහල උරුමය පිලිබදවූ අතර ඵ් කිසිවක් අන් භාෂාවල උපුටා ගැනීම් නොවීය. තවද කලාතුරකින් ගීත රචනාවේද නියැලුණේය. ඔහුගේ ගීතවල ගීත රචකයන් අතර කුමාරතුංග මුනිදාස, මර්සලින් ඡයකොඩි පියතුමා, අරියසෙන් අහුබුදු දැක්විය හැක. 1953 දී සුනිල් ශාන්තයන් විසින් මරදානේ නිව්ටන්ගොඞනැගිල්ලේ කුඞා පාසලක් අරඹන ලදි. ඵය තුලින් ශිෂය්‍යන් දහයකට පමණ නොමිලේ හැදෑරීමට අවස්ථාව සලසා දෙන ලදි. ටික කලකට පසුව මිතුරු ඇල්බට් පෙරේරා (වර්තමානයේ ඩබ්. ඩී. අමරදේව) ගුරුවරයෙක් වශයෙන් ඇතුලත් වීය. 1967 දී නෙවිල් ඡයවීර මහතා ගෙන් ජාතික ගුවන්විදුලි සේවාව සමග සම්බන්ධ වනලෙස සුනිල් ශාන්තයන් ට ඇරයුම් ලැබිණ. පසුව ශාන්තයන් ඩබ්. ඩී. අමරදේව සමග එක්ව එහි කටයුතු කරනුලදි. 1970 දී මාමාගේ නිවසින් බැහැරවු හෙතෙම 1977 දී සුනිල් ගී නමින් පටිගතයක් නිපදවනලදි. Baddaliyanage Don Joseph John alias Sunil Santha was born on 14th of April 1915 at Dehiyagatha, Jaela. His parents died whilst he was still a baby, so he was brought up by his grand mother and uncles. His youngest uncle Mr.M.J.Perera was a music lover. Sunil Santha learned to play the harmonium from him. He came first in the island in the school leaving certificate examination and won the Weeraratne award. In 1933 he passed the Teachers Final Examination. As a teacher at Mt.Calvary School he exhibited his talent in drama, vocal, music, art and handwork. 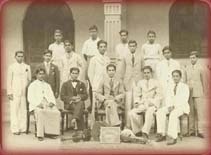 From 1936 to 1939 his students won the competition at the Southern Schools Music Competition thrice and the challenge cup was given to the Calvary school. In 1938 he passed the Intermediate Gandarva Examination and also obtained a certificate in physical training and learned to play the piono accordion and the gitar. He learned Sinhala folk songs and Wannam from Urapola Banda Gurunnanse. In 1944 he returned to the Island as Sunil Santha. He met Mr. Kapukotuwa and as The Government had appointed a person for the post of music inspector he refused the music teachers appointment. He read the books by Munidasa Kumaratunga and Raphiel Thennakoon and realized the necessity of creating Sri Lankan music. He wrote a letter titled Montessori Method of Music to the Silumina Newspaper and on shorter method to learning music to Prabodaya. He started a music class at Kanuwana, Jaela. In 1946 he stayed in the house of Suriyashankar Molligoda at Bambalapitiya and started his quest to find Sinhala Music. On the 2nd of March 1946 he sang songs at the Kumaratunga Commemoration ceremony, soon he became a superstar after he recorded Olu Pipila at the Sri Lanka Broadcasting Corporation. That was the first song recorded in a record. The people who saw him performing those days compared him to a Greek god. Another compared him to a handsome Indian prince with Aryan features. His skin was ivory in colour. He was five feet 11 inches tall. In 1946 he published his first song book "Ridi Walawa". He created songs which he sang for various charity songs like Home for the Elders of Mallika in Colombo. He published many song books. They are Hela Ridi Walawa, Mihiriyawa Mal Mihira, Heli Mihira, Sunil Handa, Song Folio, Song of Lanka, Guvan Thotilla, Desheeya Sangeethaya, Sangeethaye Atthiwarama as Sunil was against Indian Ragadari music his enemies started a battle to expel him form the Radio Ceylon. They damaged across his discs and some of the people who were with him at the beginning pirated his songs and published them to earn money. Sunil attacked these people in his song books. 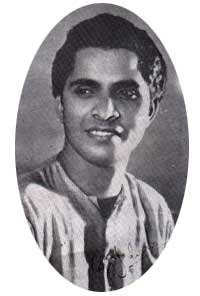 In 1951 Peramuna news paper did a survey and named Sunil Santha as the most popular singer of the year. Meanwhile the enemies of Sunil Santha who favored Hindustani Music laid a trap on him. That was to get down Mr. Ratanjankar from India to audition the Sinhala artists. They mentioned that anybody who refused that audition would be expelled from the Sri Lanka Broadcasting Corporation. The Lankadeepa News paper published an editorial against the audition of Mr. Ratanjankar. They questioned about the special reason for bringing down Ratanjankar to audition the Sinhala artists. Would that be necessary for his pupils like Sunil Santha to face that audition? Is it necessary to audition artists at this time? Are they doing that for the progress of art? That news paper protested against the audition of Ratanjankar. Sunil Santha boycotted the audition of Ratanjankar. He was expelled from the SLBC. In 1952 he married Bernadet Leelawathi Jayasekara. She was a trained teacher. In 1953 Sunil started his classes in the Maradana Newton building. He promised to teach 10 pupils free of charge. At that time Mr. Albert Perera (W.D. Amaradeva) who played the violin for Sunil Santha’s songs was having financial difficulties. Sunil Santha helped him by allowing him to teach music in his Panadura music classes. In 1955 the great journalist D.B.Dhanapala started a campaign and exposed the plight of Sunil Santha through the columns of Lankadeepa. The money collected by the paper was given to Sunil Santha. In 1956 Doctor Lester James Pieris invited Sunil to make tunes for the songs of "Rekhawa" and "Sandeshaya". The songs were masterpieces and even now they are very popular. Sunil tried various trades like selling clothes and doing photography. He became very close to poor people's hearts. Many parents sent their teenage sons to get advice from Sunil Santha. 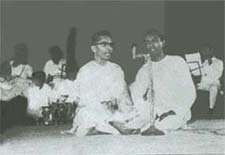 In 1967 Director General Mr. Neville Jayaweera invited Sunil Santha to the Sri Lanka Broadcasting Corporation and asked him to do programs in music. He created revolutionary music and created songs in one note and four notes and five notes. Mr. Jayaweera asked Sunil to audition the artist. Mr. H.W. Rupasinghe and W.D.Amaradeva assisted him. In 1970 Sunil moved to his uncle’s house as the land lady wanted the house. Mrs. Agnes Perera the widow of his uncle was very kind to Sunil Santha’s family and asked them to live in a section of their house. His cousins cleaned the poultry shed. They used that as a study room for the family. Sunil and Leela had three sons and one daughter. Sunil continued to repair radios and other electrical equipments. In 1977 Mr. H.M. Gunasekara who was the Director of Sri Lanka Broadcasting Corporation produced a record named "Sunil Gee." There was a debate about whether there is a written music in the Sigiri songs. Some scholars opposed that idea. Sunil created Sigiri Gee and showed that there is a possibility of written music in Kurutu Gee as our ancestors were so intelligent in constructing such great buildings as Lovamahapaya and Sigiriya. Twenty eighth of February of 1981 was the saddest day of Sunil Santha’s life. His third son Jagath was drowned in the Blue Oceanic Hotel Negombo. That death is still a mystery. Sunil suffered a heart attack and was admitted to the Colombo General Hospital. He died on the 11th April 1981. His eyes were donated to two people. On the 13th of April he was laid to rest in the Dehiyagatha cemetery. සූකරයා මුම්බායි එද්දී ඓශ්වර්යාට උණ! ඒත් කිසිදා ගයා නැති සුනිල් සාන්ත පුතු ලංකා සාන්ත කියන්නෙ ගායනාව තමන්ට දුෂ්කර කටයුත්තක්ය කියල. සුනිල් සාන්තයන් දමාපු ඔය නීතිය දරුවන් හතර දෙනාගෙම ජීවිත වෙනස් කළා. පුතුන් තුන්දෙනා ඉංජිනේරුවන් වුණෙත් එකම දූ පශු වෛද්‍යවරියක් වුණෙත් එහි ප්‍රතිඵලයක් විදියට. තරුවක දරුවෙක් වුණත් වෙනස් මඟක් ගත්තෙ ඇයි කියල හොයද්දි සමහර අතීත කතා ඉබේ ඈඳෙනව. 1939 ඉන්දියාවට ගිය සුනිල් සාන්තයන් 1944 ආපහු මව් රටට එන්නෙ සිතාර් වාදනය සහ ගායනය පිළිබඳ ඉහළම උපාධිය සමත් වෙලා. ඒත් හිටපු පාලකයො සුදුසු රැකියාවක් නොදුන්න විතරක් නෙවෙයි, ගුවන් විදුලියෙ ‘ශ්‍රේණි’ ගත කරන පරීක්‍ෂණයට ගෙන්වුවෙත් ඉන්දියානු සංගීතඥයෙක්. ඒ වන විටත් එම විභාගම සමත්ව එම සුදුසුකමම ලබා හිටි සුනිල් සාන්තයන්ට සිද්ධවෙනව, සුදුසුකම් පසෙකලා ශ්‍රේණිගත කිරීම් විභාගයට මුහුණ දෙන්න. පඳුරක් ගානෙ නාළිකා නොතිබුණු එදා, ගායකයකුට දොරට වැඩිය හැකි වූ එකම මඟ ගුවන් විදුලිය. ඒ, ගුවන් විදුලිය දමාපු නීතිය. සුදුසුකම් සපුරා ඇති අභිමානවත් හිත ඉඩ දෙන්නෑ ඊට හිස නමන්න. ඔහු ගුවන් විදුලියෙන් ඈත් වෙනව. සුදුසුකම්වලට දොර වහපු මිනිසුන් ගෙ එළිපත්තටවත් නොයා ගෙදර පන්ති පවත්වනව. ”අපේ පුංචි කාලෙ මට මතක ඇති දා ඉඳල තාත්තා ගෙදර. අම්මගෙ ගුරු වැටුප විතරයි හයියකට තිබුණෙ. තාත්තා සංගීත පොත් ලියුව. පන්ති පැවැත්වුව. රෙදි විකුණුව. කරෝල විකුණුව. හැබැයි කොයි දේකින්වත් ලාබ ලැබුවෙ නැහැ. තාත්තගෙන් රෙදි අරගෙන ගියපු සමහර වෙළෙන්දො පාරෙ දකින කොට හැංගෙනව. කරෝල වෙළෙඳාමත් ඒ වගේ. හැමදේම ටික කලයි. තාත්තා ‘ඕලු පිපීලා’ ලිව්වෙත් ඔහොම ගෙදර ඉන්න කාලෙ. හැබැයි 1946 කොටා පාරේ ගුවන් විදුලියෙ මුලින්ම කපාපු තැටිය තාත්තගෙ ‘ඕලු පිපීලා’. මට මතකයි ඒ කාලෙ සී.ටී. ප්‍රනාන්දු, වගේ පස්සෙ කාලෙක ප්‍රවීණයන් වෙච්චි හුඟ දෙනෙක් තාත්තගෙ සංගීත පන්තිවලට ආවා. “සංගීතය කළොත් අපිත් අතරමං වෙයි කියල තාත්තා හිතන්න ඇත්තෙ ඒ නිසා. තාත්තා හැම වෙලාවෙම කිව්ව විතරක් නෙවෙයි, ඇත්තටම ඒ ගමන අපිව ගෙනාවා. දෙහියගාත රෝමානු කතෝලික පිරිමි පාසල අපි තුන්දෙනාම උගත් පාසල. ඒ වගේම තාත්තා ඉගෙන ගත්තෙත් ඒ පාසලේ. මං උසස් පෙළ කළේ මීගමුව ශාන්ත මරියා විදුහලේ. ඉස්කෝලෙ යන කාලෙ මං හුඟක් දක්‍ෂ ක්‍රීඩාවලට. හැම ‘මීට් එකම මං දිවුව. දිනුවා. හැබැයි මටම කියල ‘රනින් ෂූස්’ වත් නැතිව. ගෙදරට කරදර නොකර ඒ අවශ්‍යතා සපිරුණේ යාළුවන්ගෙන්. මට කවදත් හොඳ යාළුවො හිටියා. එක කාලයක් තිබුණා අපි තුන්දෙනාම පේරාදෙණිය ඉංජිනේරු පීඨයෙ හිටපු. 1979 ජගත් සාන්ත මල්ලියි මායි විශ්ව විද්‍යාලයෙන් පිටවුණා. සංගීත දිවියෙ පැතුම් බොඳව ගියත් දූ පුතුන් වෙනුවෙන් මැවූ සිහින ඒ හැටියෙන් ම ඉටු වූ සතුටින් සුනිල් සාන්තයන් ගෙ හිත පිරිල. ඒත් නොහිතපු දවසක් උදා වෙනව. ජගත් පුතු හිටි අඩියෙ නාන තටාකයදි මිය ගියේ යාළුවොත් එක්ක ගිය විනෝද ගමනකදි. ඇහැක් වගේ උස් මහත් කරපු දරුවන්ගෙන් හුරතලා, බාල පුතු. ඔහුගෙ වියෝව දරා ගත නොහැකි වූ සුනිල් සාන්තයන් ද හෘදයාබාධයකින් මෙලොව හැර දමා යනව. ඒ හරියටම ජගත් පුතුගෙ වියෝවෙන් සති 6 ක් ගෙවෙද්දි. ”තාත්තා හිටියෙ හරිම දුකෙන්. අපිව මේ තැනට ගේන්න එයා හුඟක් දුක් වින්ඳා. එයා විඳපු දුක් අපිට නොවෙන්නයි, අපිව එගොඩ කළේ. තාත්තා නැතිවෙනකොට වයස හැට ගණනක්. ඒ වෙනකොට අපි කවුරුත් විවාහ වෙලා නැහැ. ඒත් තාත්තා රෝහිණීව දැනගෙන හිටියා. ”එහෙ ගිය අලුත මට රස්සාවක් නෑ. රෝහිණිගෙ රස්සාව විතරයි. මං ගෙදරට වෙලා දරුව බලා ගත්තා. අපි හිටියේ ජෝර්ජියා ප්‍රාන්තයේ. ඒක සුදු කළු බේදය තදින්ම තියෙන ප්‍රාන්තයක්. නමුත් අපිට කිසිදාක කරදරයක් වෙලා නෑ. මුල් කාලෙ අපි දෙන්න දවසට පැය 20 ක් වැඩ කරපු වෙලාවල් තිබුණ. ගණන් හදල බලබලා තමයි වියදම් කළේ. පිරිමහගෙන ජීවත් වෙන්න අපි පුරුදු වුණා. 993 දි අපි ලංකාවට ඇවිත් අත්හදා බැලුව. රෝහිණී සහ ලංකා නම් එකතු කරල, Ro – Lanka නමින් අපි ව්‍යාපාරය පටන් ගත්තා. ඒ සතුට විඳින්නට තාත්තා නැතත් ලීලා සුනිල් සාන්ත ඔවුන්ගෙ අම්මා හිතින් දහස්වර ඒ සැනසිල්ල විඳිනව ඇති කියලයි මට හිතුණෙ. ”අපේ ලොකු පුතා ජගත් මනුර සාන්ත. මිය ගිය මගේ මල්ලි සිහිවෙන්නයි එයාගෙ නම මගේ පුතාට තැබුවෙ. එයාට දැන් 22 ක්. ලොකු පුතා අපේ ව්‍යාපාරය කරගෙන යනවා වෙනත් ප්‍රාන්තයක. සවිනි ලංකා සාන්ත, වෛද්‍ය විද්‍යාව හදාරනව. එයාට වයස 19 ක්. උදාර සුනිල් සාන්ත අපේ බාල පුතා. එයාත් ඉගෙන ගන්නව. මගේ දරුවොත් හොඳට ඉගෙන ගෙන තැනකට ඒවි. ඒත් ඇමරිකාවෙ තමයි ඔවුන්ගෙ අනාගතය. කොහොම වුණත් ලංකා සාන්ත වගේම සුනිල් සාන්ත සහ කලා සාන්ත (නැගණී) දරුවන් තාත්තගෙ හීන හැබෑ කළා. කලා සාන්ත පශු වෛද්‍යවරියක්. ඇයත් සමඟ අම්මාගෙ පදිංචිය රාජගිරියේ. යුගයක් එකලු කළ තරුවක, දරුවෙක් දිරියෙන් ආ ගමනක් කියලයි අන්තිමට කියන්න වෙන්නෙ.